As a practising scientist I too am concerned about the reliability of the definition of the `Beard Second’. In addition to the intrinsic variability from one individual to another (including genetic influences) many external environmental factors affect beard growth, so any definition must include conditions such as temperature, pressure, sunlight levels and whether or not the beard is supplied with nutrients. In any case the term `average’ usually applies to the arithmetic mean, whereas the quoted text seems to imply the median. My advice to the Beard Liberation Front is to refer this matter to the National Measurement and Regulation Office for review but along with most government offices nowadays it only seems interested in issues that directly affect the ability of businesses to profit rather than safeguarding the accuracy and reproducibility of scientific matters of direct interest to the public, such as the rate of beard growth. 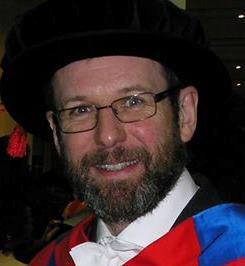 In the longer term, however, I believe the only way to establish a reliable standard for the `beard second’ is through an extensive research programme. A detailed proposal is in preparation to UK Research and Innovation, as it seems an appropriate topic for an interdisciplinary award. The Beard Liberation Front, the informal network of beard wearers, has expressed doubt over the accuracy of the unit of measurement known as the ‘Beard-Second’. The ‘Beard-Second’ is designed to measure how quickly in time a beard grows. The beard-second is a unit of length inspired by the light-year, but applicable to extremely short distances such as those in integrated circuits. The beard-second is defined as the length an average beard grows in one second. Kemp Bennett Kolb defines the distance as exactly 100 angstroms (10 nanometers). as does Nordling and Österman’s Physics Handbook. 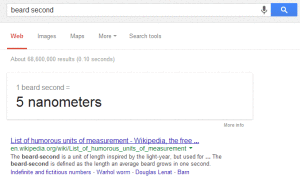 However, Google Calculator supports the beard-second for unit conversions using the value 5 nm. The Beard Liberation Front, the informal network of beard wearers, has warned of Guy Fawkes pogonophobia as bonfires around the country burn effigies of a hirsute man over the weekend. Pogonophobia is the ancient Greek for an irrational fear or hatred of facial hair, known as beardism in modern English. I have been remiss in not passing on this important poll, but there’s still plenty of time to vote for Katie Hopkins.. The Beard Liberation Front, the informal network of beard wearers, has said that it is searching for the Pogonophobe of the Year as Beard Week 2015, a celebration of hirsuteness, starts on 29th June. In 2014 Nigel Farage, arguably the epitome of the clean shaven white man in a suit, was awarded the title. I felt the urge to reblog this to encourage folks to vote in the Beard of Autumn poll, despite not having been nominated myself, especially since the great Leonard Cohen is a candidate. Surely he deserves to win more than Roy Keane who has already shaved off his beard? The Beard Liberation Front, the informal network of beard wearers, has said that it regrets but respects the decision of Roy Keane to shave his beard ahead of Ireland’s European Championship game against Gibraltar on Saturday. Keane has a history of suddenly shaving his beard but the campaigners say that the four seasonal awards run each year are designed to capture in particular those who have noteworthy but transient beards.